Summer has finally begun! Now that we’re spending a lot of time outside, I’ve noticed my backyard is looking a little stale. So, we’ve rounded up over 25 of our favorite projects to beautify, simplify, and organize your backyard. They range from simple crafts to more complicated projects, so I hope you will enjoy all of this yard inspiration as much as I do! Sometimes all a yard needs is a good eye and a splash of color or two. Take a look through these ideas and see if you can find something that would look great in your yard. 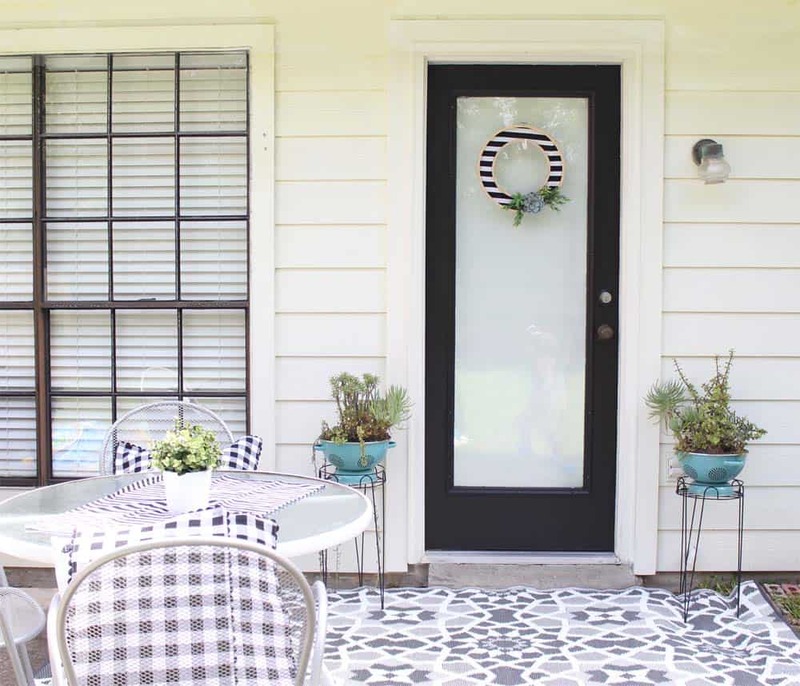 This Black Patio Door Makeover was one of our favorite projects! The before and after pictures are unbelievable. This Bright Mid-Century Patio Makeover is a great example for how a few colorful pieces can change the atmosphere of your yard. How cool does Moss Graffiti sound ? DIY Projects makes it so easy too! This Parisian Backyard Inspiration from New Darlings is simply to die for. This Spring Patio Makeover from Monica Wants It has so many great ideas about how to decorate your patio. While it would be great to spend hours and hours cleaning and pruning our yards, most of us don’t have all that time. 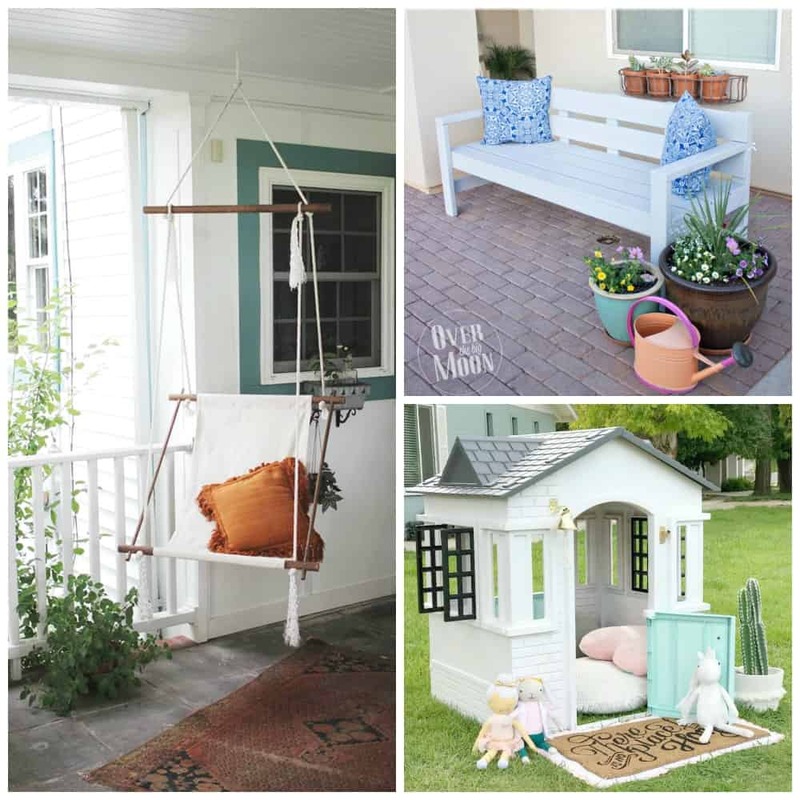 These are a few fun projects that will class up your yard without taking too much time or skill to do so. What better way to fill your summer days with bird songs than with a DIY Bird Feeder?! I love the idea of having fresh herbs whenever I want them! Bottle Herb Garden from Grillo Designs are such an easy way to do that. This Wine Bottle Bird Feeder from Elizabeth Joan Designs is so classy. Let’s get back to a little more functional. 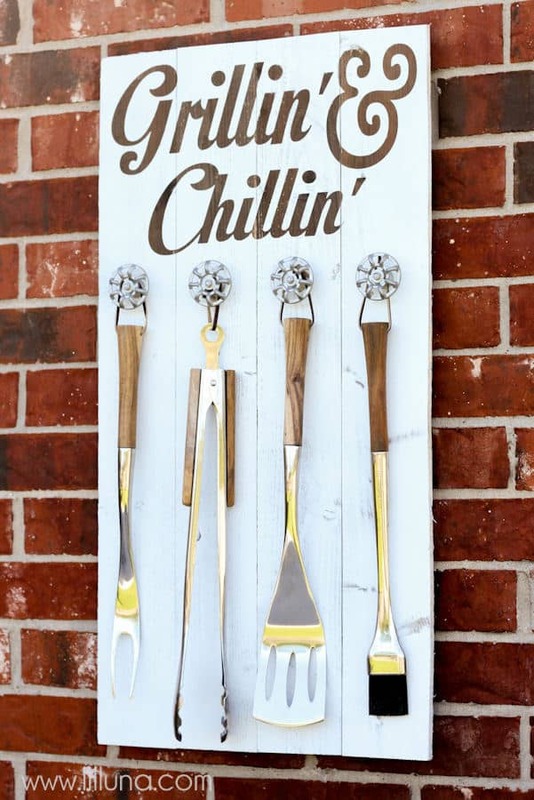 This Grill Set Holder from Lil’ Luna would be perfect next to the grill. You can never have too many plants. It’s a fact. But you do need to mix up the how you present those plants. It’s a great way to add color and life to your back yard. This DIY Wood Planter Box just never gets old, so simple and easy to personalize. If your yard is a bit short on space, vertical is the way to go. This Space Saving Vertical Vegetable Garden from ManMade is as cute as it is functional. 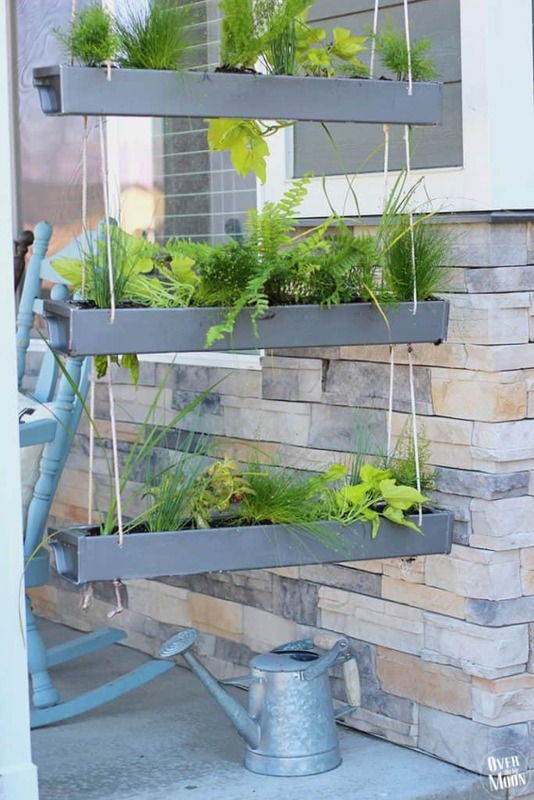 Going vertical again, this Vertical Succulent Wall Planter from Balcony Garden Web looks gorgeous! Looking for a cheap project to beautify your yard? This $10 DIY Tiered Planter from Anika’s DIY Life is so cute! I love this Hexagonal Modern Vertical Succulent Planter from Walnut Hollow, its on point for this year. Fill your porch with these adorable Rope Wrapped Pots from House By Hoff. I think I need about 30 of these Chandelier Planters from DIY Show Off, they’re amazing. You would never know what this Hose Hiding Planter was just from looking at it. Jaime Costiglio has done a great job with this tutorial. The best thing about summer, is sitting outside in the shade and getting lost in your favorite album, book, or day dream. Use these ideas to create a space for that, what more could you want from your yard? Can’t you just imagine spending lazy summer afternoons on an adorable DIY Outdoor Seating? Lena Sekine has created a super easy tutorial for us. I love the simple look of this Planter Bench from Brittany Stager. 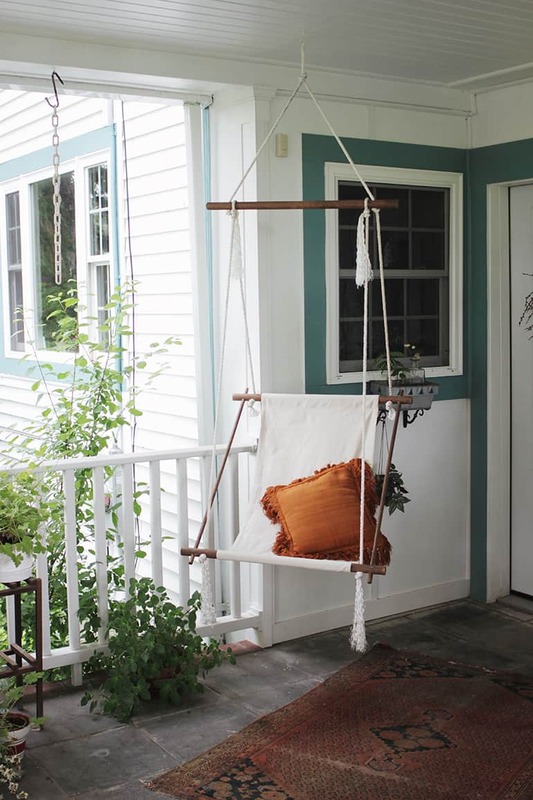 How awesome does this DIY Hanging Lounge Chair from the Merrythought sound? Couldn’t you just curl up with a book there and swing the summer days away? This DIY garden bench is perfect and sooo pretty! I love a good white paint, it looks sooo good in a garden! As intimidating as they may be, sometimes a big project can have a big impact on your backyard. We’ve found some of the easiest, and biggest impact projects we can get with great tutorials and instructions. 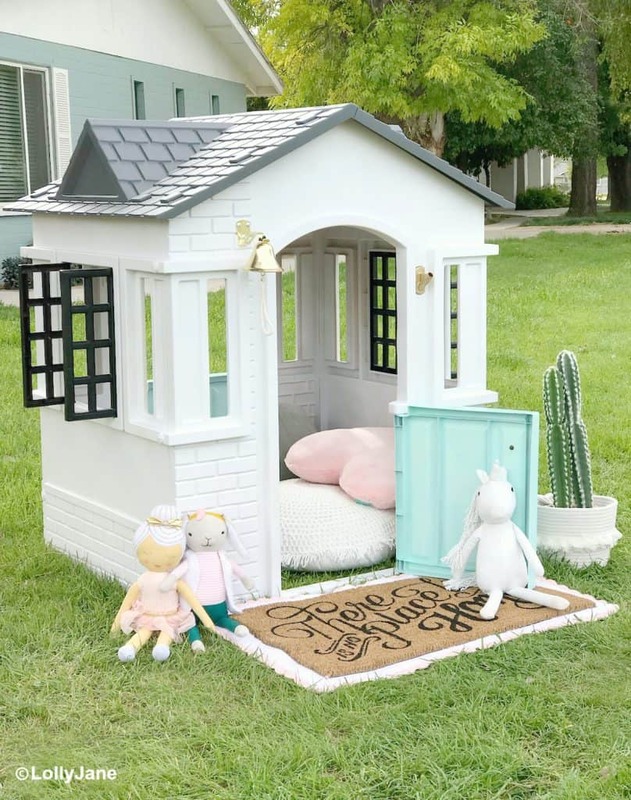 Okay this Little Tikes playhouse makeover by Lolly Jane is to-die-for. So cute! Now I want to go thrifting to find something fun to make over, too! I was worried a Pergola would be too complicated of a project, but after reading this tutorial by the Created Home for this Super Frugal Pergola, it seems totally manageable. Classics are classics for a reason. This DIY Sandbox from Design, Dining and Diapers even has instructions for a DIY sunshade. How cool is this Shutter Fence from Cottage in the Oaks? I mean do I really need to sell you on a garden NOOK? I’ve died. What summer is complete without a fire pit? Make your own with this Step-by-Step Fire Pit from Tuff Guard Hose. I love this simple DIY Geometric Painted Floor from The Little Green Notebook. It’s a great way to splash a boring patio with a bit of color. What’s your yard got going on? 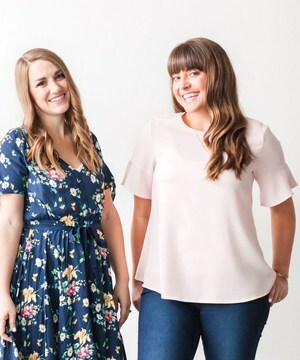 Are you tempted to try any of these ideas or inspirations? Let us know!